A favourite visit whilst we are holidaying in Pembrokeshire, is Barafundle Bay. It is a lovely place to visit for several reasons. Firstly, you can only get to it on foot. This means that it remains unspoilt and is usually quite quiet. It is accessible from the coastal path. If you park at Stackpole Quay to walk to Barafundle, you will discover the second reason for visiting this area: the Boat House tearoom. This is run by the National Trust and provides light meals and fabulous cakes. Stackpole Quay is a tiny little harbour and also delightful. If you want more reasons to visit, there is a circular walk from Stackpole Quay, to Barafundle Bay, and then on to Broadhaven Beach, through the lilyponds, and across the fields back to Stackpole Quay. There is parking at the lilyponds at Bosherton as well, and at Broadhaven, if you wish to walk to Barafundle Bay from the other side. The headland above Barafundle Bay is sometimes graced with the presence of wild ponies, and you can see razorbills swooping a nesting. 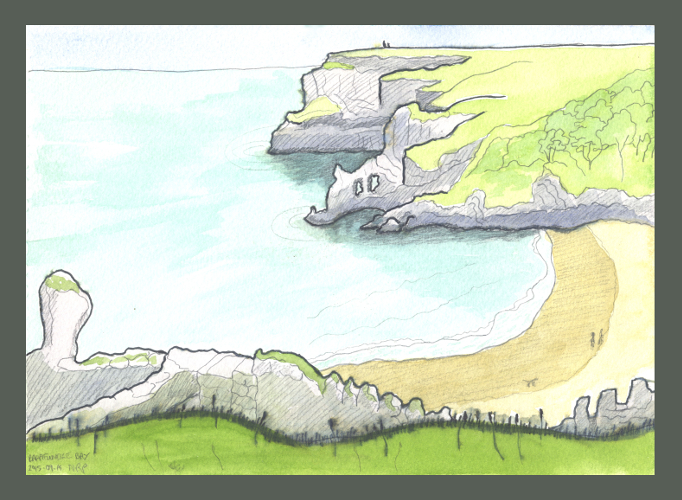 Above is my watercolour of Barafundle Bay painted from the wall to the east of the bay in 2015.